Pyramids Fortune is an online Nektan casino that was first brought to the casino scene in 2017 when it was founded. This safe and fair casino is licensed under the United Kingdom Gambling Commission. This is a very popular British casino that has an ancient Egypt theme to it. It is filled with a great selection of promotions and jackpot games, which we will uncover in this casino review. We will take a look at the website as a whole, and also how the experience of this casino compares to other Nektan casinos. The Pyramid’s Fortune casino is very aesthetically pleasing and really hits the nail on the head with their ancient Egypt theme. The background itself features a black screen with stars and famous ancient Egyptian icons, which includes the Eye of Horus, the Ankh, Anubis, scarab beetle and more. These icons are represented in a golden outline, the scarab ibis, and more. The lay out of this Nektan casino is no different to what experienced Nektan customers are used to. At the top of the casino page, you will find the Pyramid’s Fortune logo as well as the Pyramids Fortune login options. Underneath this you can find the section of promotions and bonus games that may tempt new customers to sign up with Pyramids Fortune, which we will discuss later on. Down the left side is the menu section for the casino, this is where you can find the different types of casino games, which include live dealer games, instant win games, jackpot games, new games and more, as well as a list of software providers and a category of different wins. The rest of the screen is filled with the thumbnails of the best casino games that are recommended to all players, that have a play button on them when you hover over them in order to allow quick play access. As you make your way to the bottom of the casino screen, you will find a range of quick links, licensing certificates and payment options. Pyramid’s Fortune has a range of the best casino software’s in the industry. This is typical of a Nektan casino site, where a range of the best gaming developers have brought their top casino games to the casino so that players can have a great online casino betting experience and play some of the most rewarding casino games in the market. Some of these gaming developers include: Netent, Microgaming, Realistic Games, IGT, NYX, Blueprint, Iron Dog, Big Time Gaming, Gamevy, Core Gaming, Konami, Foxium, Evolution Gaming, Yggdrasil, Merkur, Scientific Games, Lightening Box Games, Pragmatic Play, ELK Studios, Bet Digital and more. Nektan casinos do tend to offer some of the most lucrative welcome packages that you could find at any casino. Well Pyramid’s Fortune offers one of the most rewarding welcome packages of any Nektan casinos, as well as further promotions for new and existing customers can claim. 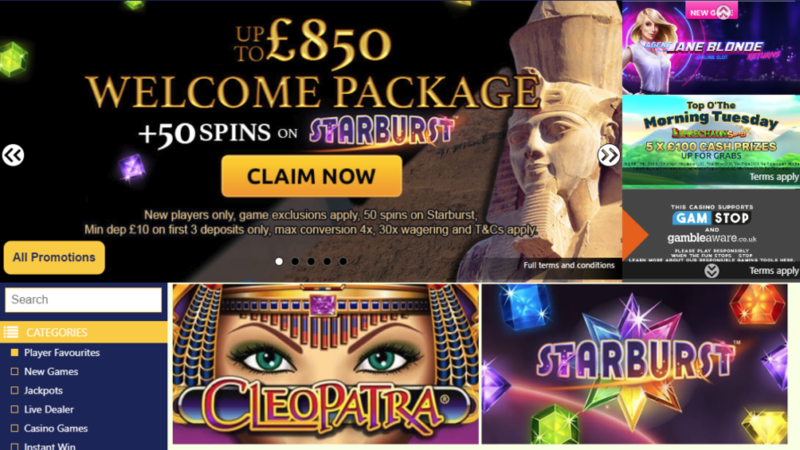 New customers who register an account with Pyramid’s Fortune can claim up to an astonishing £850, and on top of that, customers can receive 50 free spins to use on Starburst, one of the most popular slot games in the industry. This is a great way of getting the ball rolling with your casino account and being able to experience some of the awesome games that you can play at Pyramid’s Fortune. This can help you create further wins and continue to have a positive betting account balance. Other promotions for new and existing customers to claim are: Happy Hour Free Spins, Tuesday Cash Prizes, Hump Day Free Spins, Weekend Bonanza Free Spins. There is essentially prizes to be won every single day at this casino, keeping the high entertainment value of the casino. Pyramid’s Fortune Casino has hundreds of casino games for customers to experience. Being a Nektan casino, you can expect the very best casino content. In all of their casinos, they include some top-quality gaming providers who allow access to their best casino game creations. There is a variety of different gaming types at this casino, players can experience: Video slots, table games, live dealer games, instant win games, jackpot games and loads more. As well as this, they can experience different variations of some games, for example, they can play different roulette games and poker games. The customer support offered at this casino is excellent. Nektan are known for offering great customer support to their players. They are good at catering for issues, getting them resolved with ease. The available contact methods at this casino include: Live Chat, Telephone and Email. Live chat is an excellent form of customer support where you can go into a chatroom with a member of team, discussing what your betting issues are and getting them resolved as quick as possible. The same applies to telephone support, where you don’t even need to type out the issue, you can simply speak to a member of team over the phone. The telephone support line is open between, 8am to midnight. Email support is open 24 hours; however, it can take up to 24 hours for a reply. The range of payment methods provided at this casino are excellent. It is the same for all Nektan casinos, whether they are new or old, they all have a great range of payment methods to use. These payment methods include: Visa, Visa Electron, Maestro, Mastercard, Neteller, Skrill, Boku, Paysafe card, Zimpler, Trustly, PayPal. Note that you cannot use an e-wallet to claim one of the bonuses at this casino. To conclude this casino review, Pyramid’s Fortune is one of Nektan’s most rewarding casino sites. It has one of the biggest welcome bonuses of any Nektan casino and this makes it even easier for customers to be persuaded to join, as they get to experience the greatness of this casino using free cash funds. This could also possibly lead to further wins. On top of that, there are free spins to take advantage of too. The selection of games is awesome and there are a range of payment methods to use to deposit and withdraw funds with.